Ah, South Coast Plaza: The mall that's too classy for a food court; where The Devil wears Prada, but doesn't eat Hot Dog on A Stick. 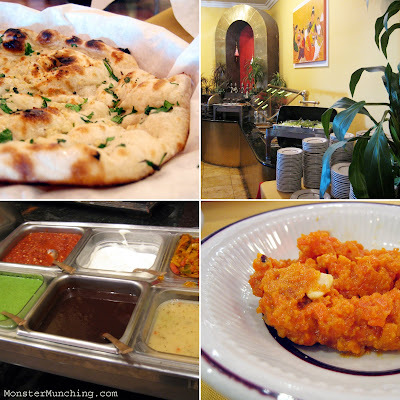 Instead it's got some of Orange County's best fine dining options. Namely, there's Marche Moderne and Hamamori, because what's a few more Benjamins on lunch when you've already spent your entire stimulus check on a pair of shoes. Well, there's Macy's Signature Kitchen, the closest thing the mall has to a food court. Or Nordstroms Cafe. 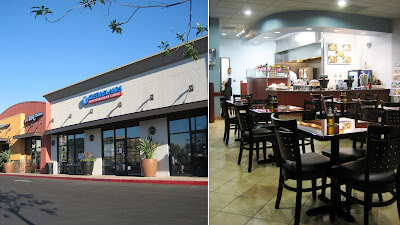 Perhaps that dependable chain, Corner Bakery. But arguably the most popular eatery at SCP is Lawry's Carvery, a quick service version of the full-blown prime rib restaurant you might have driven past in Beverly Hills. Here Ms. Hathaway can sink her horse-like chompers on a slab of meat without so much as a waiter bringing it to her. 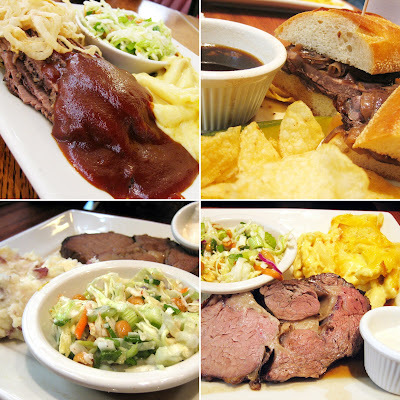 The prime rib plate -- $15.99 for a 6-ouncer -- includes a thimble of searing horseradish, one side and coleslaw. And unlike Cat Cora's BBQ platters, it actually fills you up, especially if you choose the rich cheddar and parmesan-encrusted mac and cheese, which employs penne pasta instead of the elbow-shaped stuff from the blue box. I usually get the brisket for $12.99. Slices of beef, cut across the grain so that it's always tender, fanned out on the plate and smothered in maybe a bit too much of their BBQ sauce. The best part are the crispy wisps of onion straws that's actually more like a third side item than garnish. The roast beef dip sandwich isn't as tender or elegant as Houston's (The Best French Dip in History) or decadently wet and nostalgic as Philippe's (The First French Dip According to History), but it's serviceable and packed with plenty of hulking pieces for the $8.99 price tag. Instead of dipping, I skip the niceties and douse both slices of bread with the jus, being careful not to drench or dampen the crunchy homemade chips that it comes with. It's plenty of food for long-suffering assistants of megalomaniacs. Of course, in this economy, it's more likely that she'll opt for Del Taco (also available, next to Sears). *This post is dedicated to the memory of Celina, the mother of my friend and location scout Cecile. Ask any Asian immigrant kid: it's tough when you don't look, talk, or eat like your schoolmates. Being the odd one out, sticking out like the proverbial sore thumb, these are common experiences for the child whose mom packed up rice and stir fry for lunch while everyone else brought bologna sandwiches. "Eeew, what's that?" is the familiar refrain heard by all who got teased. It must be how Greek Islands Cuisine feels at Diamond Jamboree in Irvine. Around it towers Asian giants (oxymoronic, I know) Tokyo Table, BCD, 85°C Bakery Café, and Capital Seafood. Next door, a Korean fried chicken joint and Chae Bahn, another Korean restaurant. And there they sit: Just about the only non-Asian eatery at the center. Last Friday night, the parking lot was packed. Yet, when we walked in, there wasn't a single customer in the place. It's one thing to get teased at the playground; quite another to be downright shunned and ignored. A shame because this is good, solid and honest Greek grub, prepared with more love and care than what's served at Daphne's. 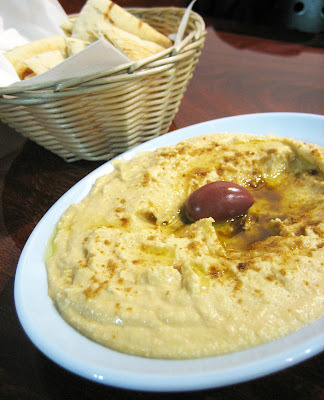 Hummus ($3.95) is swirled onto a plate, dimpled with glistening puddles of drizzled olive oil and balsamic, begging to be scooped up by triangles of warm, soft-as-cotton pita bread served in a wicker basket. 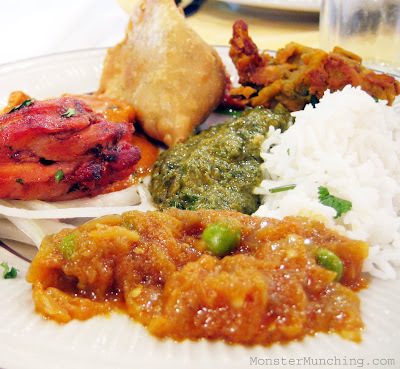 And because it was perfectly sour, garlicky and addictive, our finished plate looked like it had been licked clean. 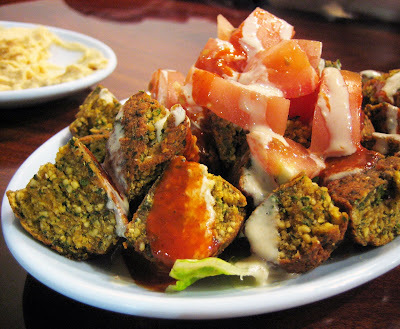 Falafels ($3.95) here are dense, substantial things, with a texture that straddles dangerously close to a VeggieBurger. They were saved simply from the fact that their outer crust was deep fried to a crunchy shell as hardy as an armadillo. Chopped to bite-sized hunks, dribbled with a yogurty zaziki and amped up with hot sauce, you'll forget that you just consumed nothing that was once attached to an animal. 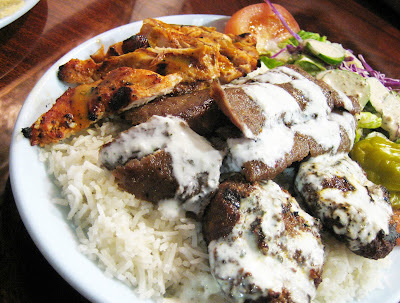 On the other hand, the Mediterranean combo ($10.25) is a meal worthy of Zeus, containing the flesh of three different beasts. The gyro, carved off of a rotating spit to floppy air foil-shaped curls, eats much like a super-seasoned hot dog. And since I'm making comparisons, the keftedes are like hamburgers if they were made of ground lamb and beef, and packed with actual flavor. I detected mint in these. The third was chicken breast, which has two qualities that are usually mutually exclusive when it comes to chicken breast: it was both moist and well-charred. Beneath it all is a Mt. Olympus-mound of fluffy rice that should play well into your mom's rule that a meal isn't a meal unless it has rice. 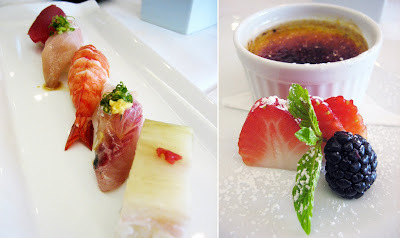 Two years ago, I experienced the omakase dinner at Bluefin. It was one of the best meals of my life. At the time, it was owner/chef Takashi Abe's only restaurant. Since then he's branched out. Izakaya Zero opened a year later in Huntington Beach. Sea Smoke in San Clemente debuted about a year after that. Though neither were necessarily bad, I regarded each spinoff as pale versions of its progenitor in the same way that CSI: Miami and CSI: NY aren't nearly as good as the original CSI. So when I wanted Abe's food, it had to be Bluefin. But with a looming holiday credit card bill on the way, a spendy $80 per person meal just didn't seem fiscally responsible. So we met them halfway. Bluefin offered a $35 5-course lunch omakase. Things started well with the amuse bouche. 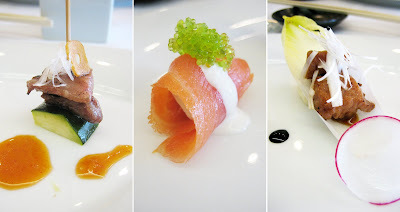 About the only thing better than one well-executed Abe amuse bouche is three well-executed Abe amuse bouches. As tiny as a Costco sample size, but ten times more "money", each were comprised of at least three components. Two unctuous cubes of fatty Kobe beef were speared on a toothpick atop a wedge of zucchini and garnished with golden-fried garlic chip. The fact that the meat melted like room-temperature butter should not be surprising; nor our desire to eat three more of them. Then there was a slip of smoked salmon, rolled to a tube, topped with a cheesy sauce and a dollop of tobiko as green as The Hulk. In our mouths, the smoky and the silky mixed with the briny and the dairy. Between our teeth, the caviar pop-pop-popped like tiny liquid-filled firecrackers. Seared toro rode on a swooping cup of endive, and it too was as decadent as the Kobe beef. But these cubes finished cleaner, with a less greasy mouth feel. Afterwards, it was a brisk isaki sashimi salad. 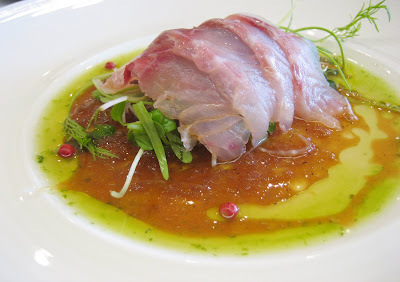 Delicate, tissue-thin slices of pinkish flesh were draped over microgreens, surrounded by house-made ponzu and restless, skittering globules of herb-flavored oil. The game was to soak up as much of the sauce as possible with every piece of the salad and sashimi. But while this course dazzled, the next one fizzled. 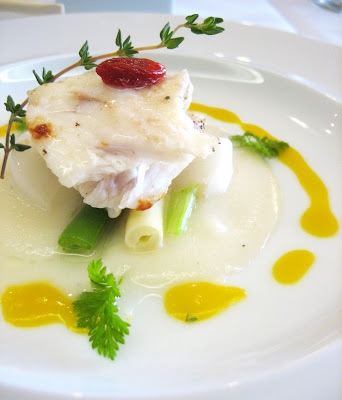 John Dory, a fish that tastes of nothing, was hardly seasoned before it was cooked. Lamentably, it was also deprived of acid -- the other thing it needed. To make matters worse, it sat on top of a puddle of bland celery puree, a mush that conjured thoughts of baby food. Though very photogenic and rich-looking, it was ultimately shallow and puerile -- the Paris Hilton of dishes. Nigiri followed, which were just fine: no better or worse than a top-end sushi bar of this price and caliber is expected to produce. The best was a halibut oshi-sushi (Osaka-style pressed sushi) which was covered with a swatch of sweet kelp as snappy as a green apple, as sugary as fondant. A capably-made creme brulee with a still crispy-caramel shell and fresh berries ended the meal -- a meal that, unfortunately, wasn't the greatest of my life, or even that day. Later that evening, we went out to eat Cafe Hiro's $30 Christmas Eve meal -- a dinner so great, I wrote a freakin' poem. 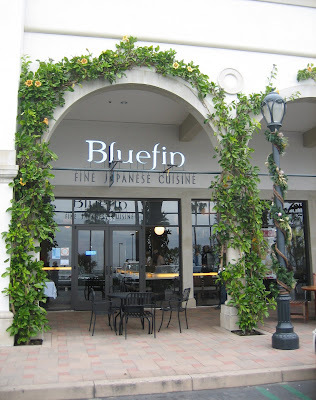 But don't get me wrong: I still love Bluefin. Since their omakase constantly changes, every visit is different. But Cafe Hiro was the better experience this time, especially when every course at the latter seemed like a Kate Winslet Oscar-worthy tour-de-force. Also, with the hard-to-ignore fact that Cafe Hiro's special 8-course meal went for $5 less than Bluefin's, I don't think I need to say who I thought was the Hottie and who was the Nottie. Hint: It's not Paris Hilton.